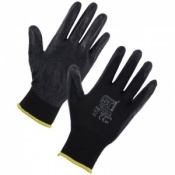 The Black PU Coated Polyester Glove PCP-B is a 13 gauge, light weight, machine knitted seamless construction polyester liner with a tough polyurethane coating on the front face. The Black PU Coated Polyester Glove PCP-B provides excellent dexterity and grip combined with improved mechanical protection. 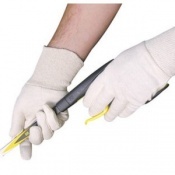 The Black PU Coated Polyester Glove PCP-B is also available in Grey. The product code for these gloves is PCP-B. I am delighted with the gloves, they are exactly what I wanted. I love these gloves, tried many others but this is the one I'd recommend if your a tiler or slater. The tight fit allows me to grab a nail easly without fumbling around and having to grab a few like others I've tried. Hands don't sweat so I can pretty much leave them on all day. Excellent just what we wanted. Would order from you guys again.